Easy-to-use 4Easysoft iPhone Manager brings three main functions to you: transfer iPhone to PC, transfer PC to iPhone, and transfer DVDs and any videos to iPhone. 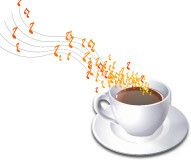 That's to say, with 4Easysoft iPhone Manager, it takes it easy to backup iPhone files to Computer, export files/folder from Computer to iPhone, and and make iPhone ringtone for sharing with your friends or other purpose. 4Easysoft iPhone Manager takes more editing features. It can display your iPhone info automatically, like the iPhone type, capacity, version, etc, create new playlist and edit playlist. In order to find your file quickly, this iPhone Manager can allows you to browse your video/audio easily (Genre, Album, Artist), etc. 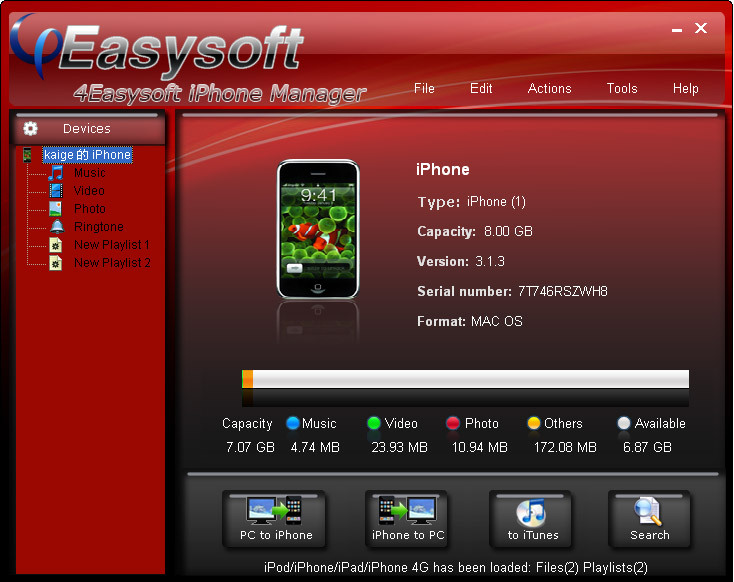 Moreover, 4Easysoft iPhone Manager is available for iPhone OS 3.0/3.1, iPod Firmware 3.0/3.1. Upgrade news: Now iPhone Manager can also highly support iTunes 10.1 and iOS 4.2. Owns the solution of DVD to iPhone Converter, iPhone Video Converter, iPhone Manager and iPhone Ringtone Converter software, helps you convert DVD/video to iPhone, iPhone 3G MPEG-4 (.mp4), etc. Upgrade news: Now iPhone Mate can support iTunes 10.1 and iOS 4.2. Ability to copy iPhone files to PC for the backup of your iPod for any purpose. Access to import files/folder from Computer to iPhone easily. Ablity to convert DVD and other videos to iPhone compatible video/audio formats, then import to iPhone directly, it even can make iPhone ringtone. Once you connect your iPod/iPhone, 4Easysoft iPhone Manager can recognize your iPod/iPhone specific information, such as iPod type, iPod capacity, iPod version, serial number, format, and the available space , used space in your iPod. 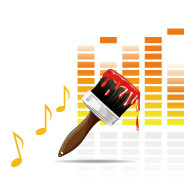 Check "Search" to browse your iPod/iPhone library, including the Genre, Artist, Album info. 4Easysoft iPhone Manager not only is compatible with iPhone, iPhone 3G, iPhone 4G and iOS 4.2 but also with iPad, iPod, iPod nano, iPod classic, iPod shuffle, iPod touch. Two click to finish your manage on iPhone, iPhone to PC, PC to iPhone, and it designed for beginners, easy enough for everyone. Provide the fastest rip speed to export iPhone files to Computer, Computer to iPhone. 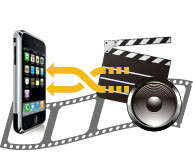 Support to convert DVD/video to iPhone.